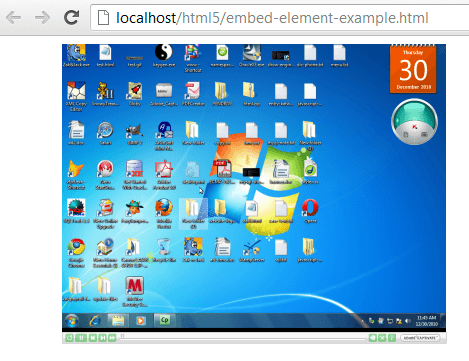 HTML5 embed element represents external non-HTML application or interactive content. A good example is when embed element is used to represent a flash movie(SWF file). The start tag is required but there is no end tag. So, this is a void element. It can not contain any other element. global attributes Any attributes which are permitted globally. 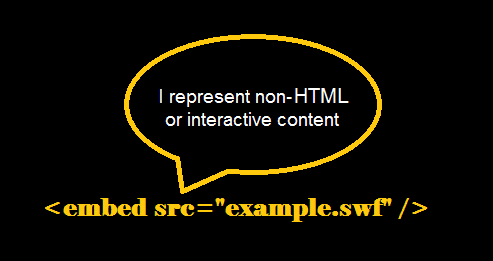 src Value of this attribute represents the url of the embedded content. type Represents the MIME type of the content embedded. Value must be a valid MIME media type. height Represents the height of the embedded content. Value is a non-negative integer. Unit is pixels. width Represents the width of the embedded content. Value is a non-negative integer. Unit is pixels. We have successfully tested the above example with following browser versions.